Waikiki’s Rock’n Reception - where traditional Hawaii meets glitzy Las Vegas. 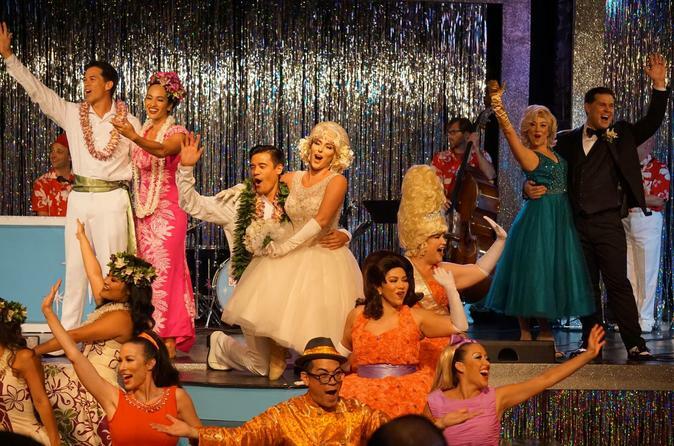 Enjoy an exciting theater and dining experience, set in 1955, in Waikiki, at the wedding reception of Kaleo Ka’ana’ana and Penny Crawford! You are a guest and part of the family at the reception of the bride and groom, Penny and Kaleo, along with their two colorful and highly entertaining families! Hawaii and Las Vegas meet for the first time, all in the name love. Fun for the entire family! And a rock'n good time! Come and be part of this lively and energetic evening! Original Hapa Haole tunes, a rock'n live band, dinner, dance, hula & hop! Join in on the conga line, test your limbo skills and sit back and marvel at the traditional hula. Waikiki's Rock'n Reception is your ticket to the hottest wedding reception of the season! So please join us and be cool Daddy-O and don’t forget to say ‘Aloha!’ to Coconut Joe!